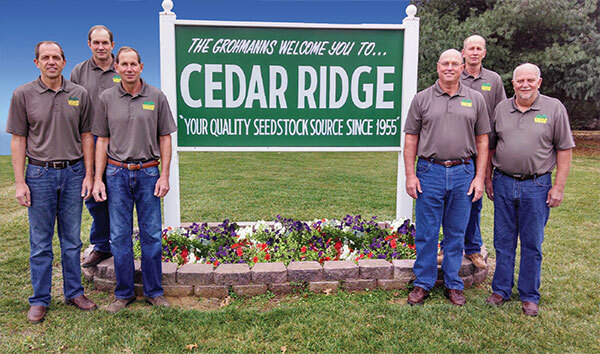 Cedar Ridge is a swine seedstock operation started in 1954 by the late Fred and Betty Grohmann when they purchased 2 Purebred Landrace sows. The farm is presently owned and operated by their 6 sons (pictured to the right). Assisting them are other family members and non-family employees. Presently Cedar Ridge has approximately 2,000 breeding sows, 100 herd boars, farms 1,200 acres and is very well known around the world for their purebred swine genetics. For the first 27 years the only breed at Cedar Ridge was Landrace. Over that time period, we became the top recorder and seller of registered Landrace hogs in the country. As word spread about the quality of our Landrace genetics, sales became very robust both domestically and internationally. With our continued success and growing customer base came our decision to add other breed’s so we could provide a full service program to our clients. Therefore, Hampshires were added in 1981 and a few years later Yorkshires and Durocs. •Over the years Cedar Ridge held 89 successful and enjoyable auction sales at our farm with several record breaking sales for numbers and gross dollars on Landrace hogs. One of our sales totaled $272,000 and had 166 boars sold. In June of 2009 we held our last auction. The decision to end our auction sales coincided with an update of the health protocols at our farm involving how we handle customers. We now have a very nice shower house for customers to utilize and all sales are made private treaty. These things help us maintain better biosecurity and health level which provides a healthier animal for our customers. International business has always been a big part of our success. We have sent numerous pigs to many different countries over the years. China has bought many pigs and Cedar Ridge has established partnerships with producers in China so that Cedar Ridge Genetics would be available on location in China. As you can see, we at Cedar Ridge are very committed to the swine seedstock business and hope to continue to be able to help all of our customers be more profitable in the future. We would like to say a huge “Thank You” to all of our past and present customers. We really appreciate your business. © 2007 - 2019 Cedar Ridge Genetics, Inc. All rights reserved.